:As a girl, Alia Joy came face to face with weakness, poverty, and loss in ways that made her doubt God was good. There were times when it felt as if God had abandoned her. What she didn't realize then was that God was always there, calling her to abandon herself. 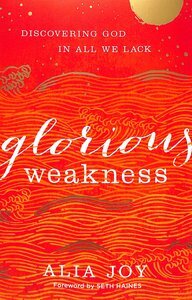 About "Glorious Weakness: Discovering God in All We Lack"